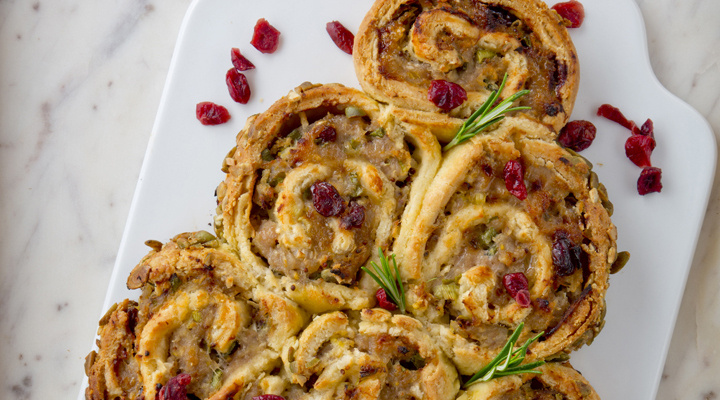 These fun and festive sausage rolls are ideal for a party, teatime or a nibble on the go. Make them a firm family favourite not just for Christmas, but all year round: try shaping them into a flower for a summer party. I like to make my dough in a food processor for ease and speed, but you could also make it by hand as you would for pastry. The filling can be made a day or two in advance and kept refrigerated or get even further ahead by freezing it until needed. 1. Preheat the oven to 220°C/gas mark 7. Line a large baking tray with non-stick baking paper. 2. Mix all the filling ingredients together. Season with a little salt and pepper and set aside. 3. To make the dough, place the flour and butter in a food processor and blitz until the mixture resembles coarse breadcrumbs. Add the milk and blitz again until the mixture comes together in a soft dough ball. Turn out onto a lightly floured surface and knead into a smooth ball. Using a rolling pin, roll the dough out into a 1cm-thick, 25cm x 36cm rectangle. 4. Spread the filling mixture evenly over the surface of the dough, leaving a 1cm border clear on one long side. Starting from the opposite long side, roll up like a Swiss roll to enclose the filling. Brush all over with the beaten egg, then roll in the pumpkin seeds to stick and coat. 5. Using a serrated knife, trim the ends and cut into 12 x 3cm-thick slices. Arrange the slices on the prepared tray, cut side up, nestled together in the shape of a Christmas tree, including the trunk. 6. Bake for 25 minutes, until the rolls sound hollow when tapped and the meat is cooked through. Serve warm or cold with your favourite chutney. Tip: Replace the sausage meat with turkey mince for an even more festive twist.